Old Town Scottsdale is the not only the oldest area in Scottsdale, it is also in my opinion the most happening. 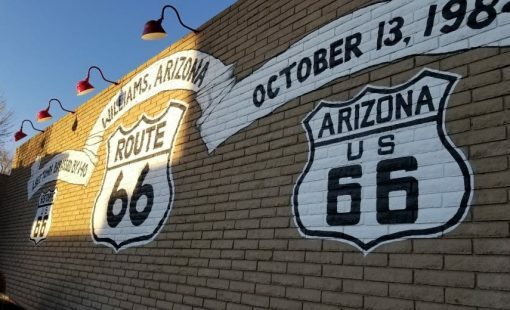 First settled in the 1880’s, this neighborhood is now a bustling collection of interesting shops and restaurants, also referred to as downtown Scottsdale. 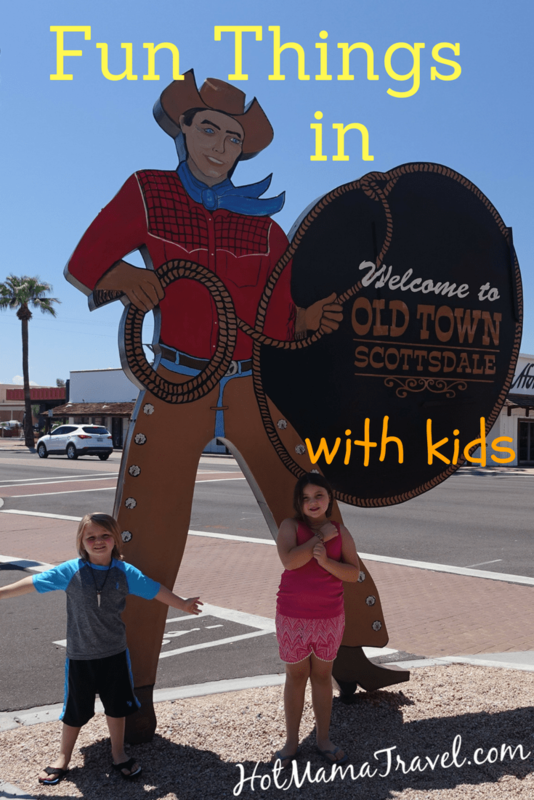 With such an exciting merge of old and new, we were super thrilled to make Old Town Scottsdale, AZ the last stop on our epic summer family road trip. This is a desert town and in the summer it gets hot. When looking for where to stay in Scottsdale, look for place with a nice pool for keeping cool day or night. Whenever we are visiting the desert, we love to night swim. So a fun outdoor pool is always a must when choosing a hotel for our family. This trip we were invited to stay at Best Western Plus Sundial, which was located right across the street from the Entertainment District and just minutes from Old Town Scottsdale. With complimentary breakfast, balconies for enjoying the warm deserts nights and a relaxing outdoor pool, it was the perfect fit for our family. We will definitely be staying here again. You can see our full in-depth review of the Sundial Hotel HERE. The Saguaro is a brightly colored hip hotel, located right next to Old Scottsdale. Complete with a lively pool and various lounge areas complete with fire pits, this hotel is a great choice if you are looking for affordable fun. Location is everything with Scottsdale hotels and the Marriott is located in the heart of Old Town. In addition to the comforts one would expect from a Marriott, there is also a lovely rooftop pool and patio with fire pits. This hotel is a lush oasis in Old Town Scottsdale, complete with two pools and a lagoon. The main pool or La Boca Pool is luxurious with private cabanas available for retreating from the hot desert sun. It also happens to be located right off the Canal Club Poolside restaurant, perfect for keeping those day drinks coming. The second pool is the La Playa or beach pool. Yes, there is sand and guests are encouraged to build your best sand castles. Considered a premier luxury resort, it is also one the best Scottsdale family resorts. First of all, there is the Funician’s Club. This children’s program for ages 5-12 offers daily outdoor and indoor activities as well as crafts and movie and game nights. Then there are the pools! There are several pools actually, including a kid zone, complete with a suspension bridge, tree house, spray guns and water spouts. Seriously, how fun is that? The desert is hot and you just can’t go wrong with multiple sparkling pools. The Kasbah Pool and Oasis Pool are perfect for hanging out with the family, sipping on something cold while the Joya Terrace Pool is reserved for spa guest only. 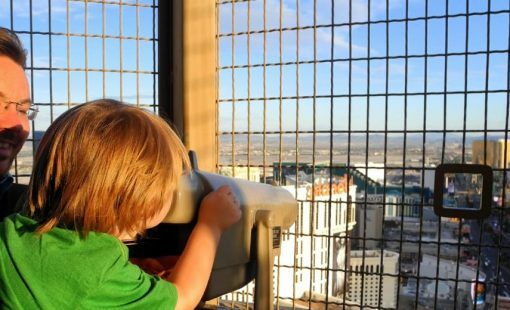 For the kids, there is the Omni Kids Crew program which includes a backpack filled with fun items like an activity book, crayons, stickers, game cards, binoculars and a table top game. They also receive milk and cookies delivered to their guest room on the first night. This 27-arce resort oozes family-friendliness. The 2.5-arce water playground has a 3-story high waterslide and a sand beach will have your kids squealing in excitement. Keep is dry playing on the Lost Dutchman’s Playground or hanging out at the Camp Hyatt kids club where days are filled with fun activities and learning. In addition to all the above, there are numerous family activities available throughout the resort. This place is loaded with family fun. There are six pools, including Sonoran Splash which features two 200 ft waterslides! One is a really cool after dark techno waterslide that has disco lights, music and fog! Where was this when I was a kid? In addition to all that, there are dive-in movies, a free-form lagoon with lagoon fishing available, a family adventure center, sport court and playground! Amazing Old Scottsdale restaurants are not hard to find. This is a mecca for foodies looking for creative, independently owned eats. The options are as diverse as they are endless. Unfortunately, we did not have enough time in town to eat everywhere. However, we did have a lovely dinner at Italian Grotto. It is hard to go wrong with Italian food and the kids loved their pasta, while I (of course) loved my wine! Plus it was right on the corner of Scottsdale Road, walking distance from where we spent our day. We also stopped by the Great Australian Bakery for a quick beer while we were out shopping and ended up sharing one of their authentic savory meat pies. It was so delicious and the kids were really big fans, begging for more. See full list of restaurants in Old Town Scottsdale, Az. 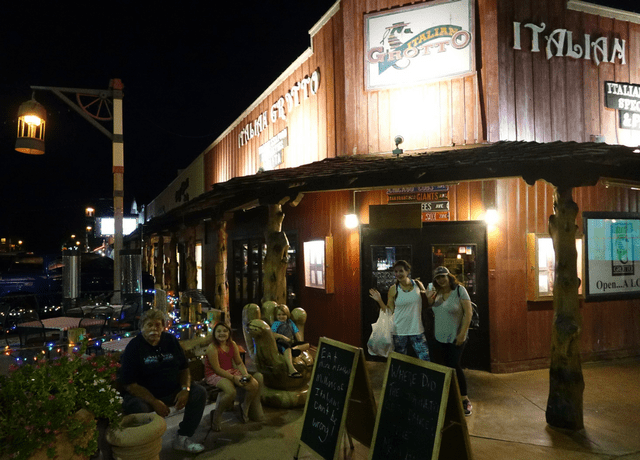 Old Town Scottsdale is loaded with fun bars, so it makes it hard to believe that it was founded as a “dry” town and stayed that way until after the repeal of Prohibition. Now, music and laughter fills the streets as visitors and locals escape the desert heat over cold drinks. Just because we travel with kids doesn’t mean we don’t enjoy a hot bar and cold beer. 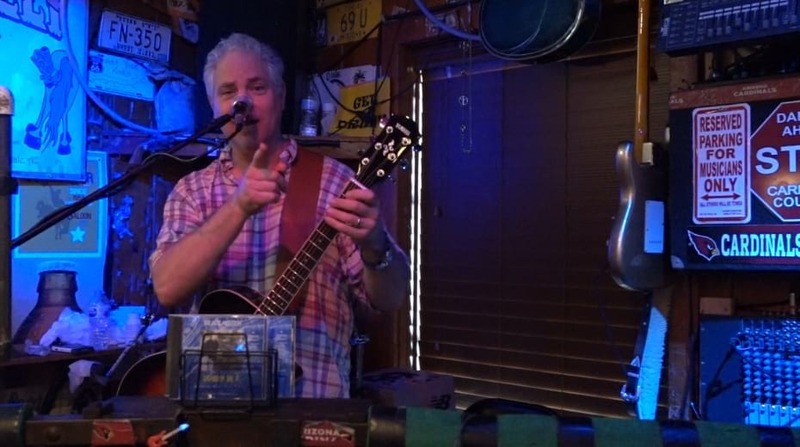 As per usual, we try to seek out venues that also offer live music. 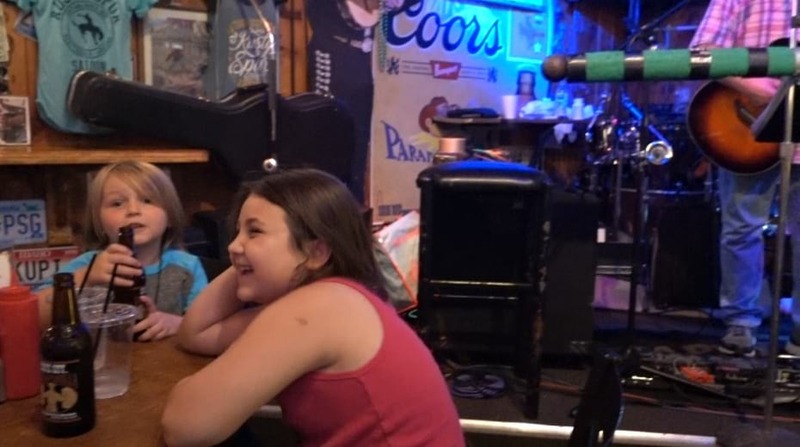 Not only is it fun for us adults, but it also provides entertainment for the kiddos. 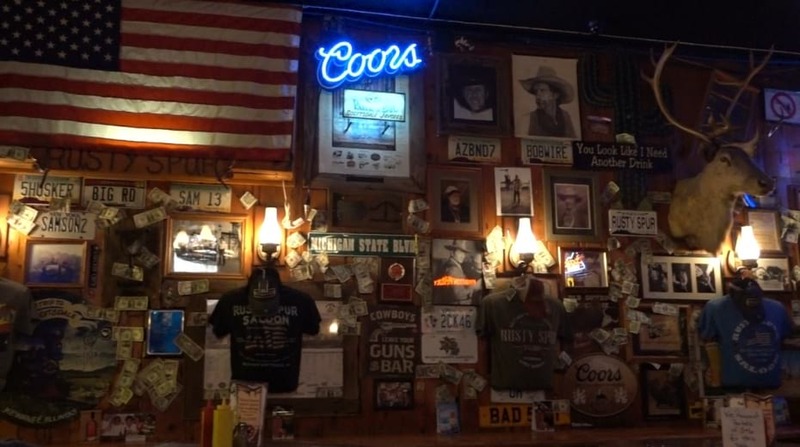 One of those great Old Scottsdale bars is The Rusty Spur, which was originally a bank. 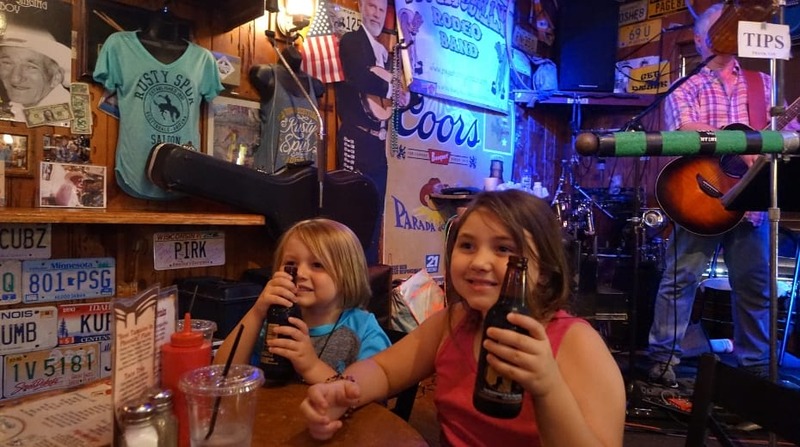 It is rustic and lively, there is live music daily and the kids are allowed, which is basically our definition of kid-friendly. Whoohoo! Interestingly enough, the vault that once held money is now used to hold liquor. For spending your day eating and drinking around the city, check out these great deals on Living Social. 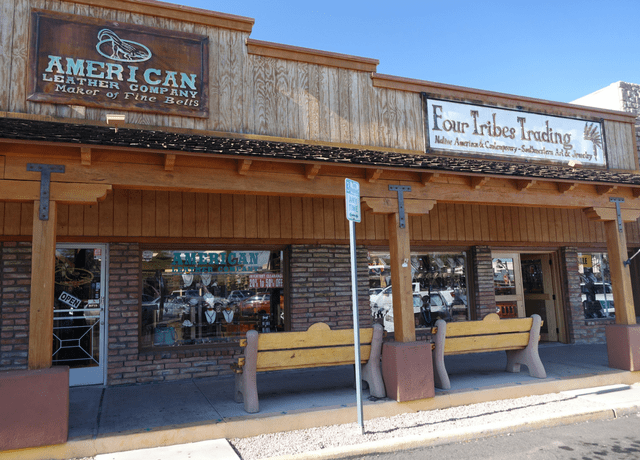 Old Town Scottsdale is a hub for shopping and dining, but there is also some historical sites to explore. 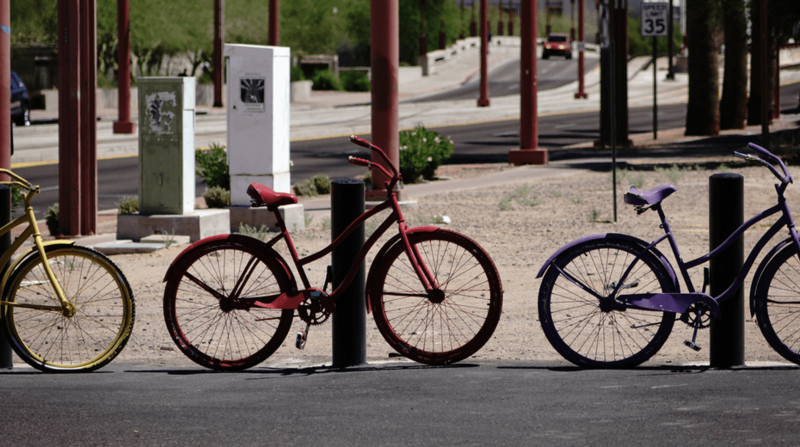 One of the things to do in Scottsdale with kids is to check out the Little Red Schoolhouse. Built in 1909, it now the home of the Scottsdale Historical Museum. 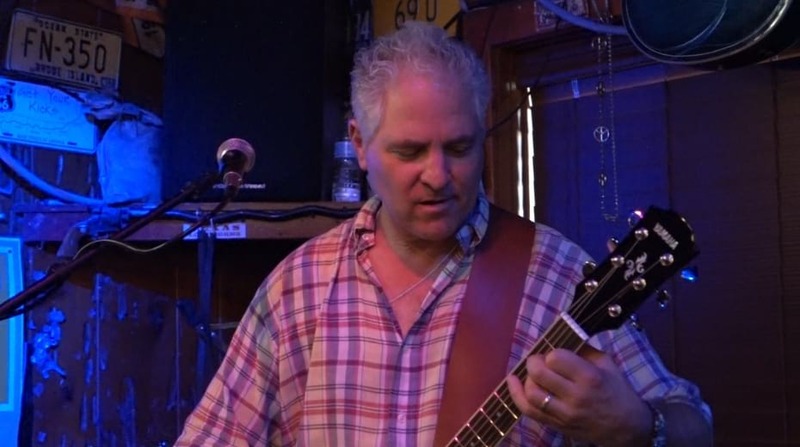 Like any good downtown, Old Town Scottsdale has a thriving art scene. 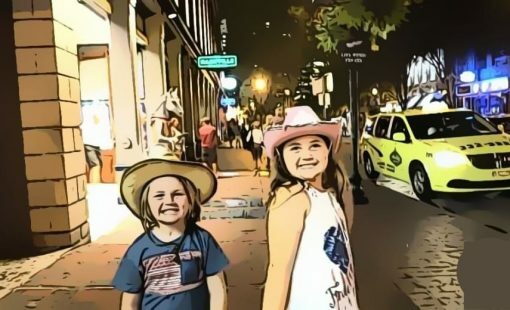 If art is your family’s thing then you will love wandering through the number of art galleries that grace the streets of Old Scottsdale. Mixing art, history and culture, be sure to visit the Western Spirit: Scottsdale’s Museum of the West. There are rotating exhibits that features western art and historic artifacts as well as performances and a sculpture yard. If looking for things to in Scottsdale with family this is a great choice. Not only is it a learning opportunity, kids under five are free. Old Town Scottsdale shopping is a must. The shops are unique, quirky and offer pieces from local artist as well as cultural items. We had a blast just wandering the streets store hopping. The kids loved all the interesting items and had fun spending their money on unique treasures. 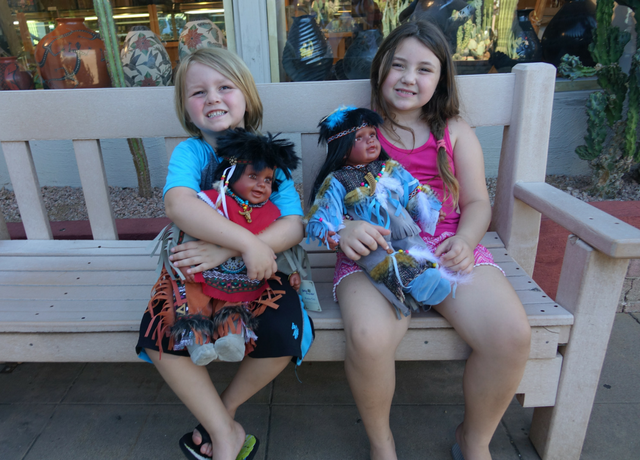 The best find of the day were these amazing Native American dolls! I don’t who loved them more, me or the kids. 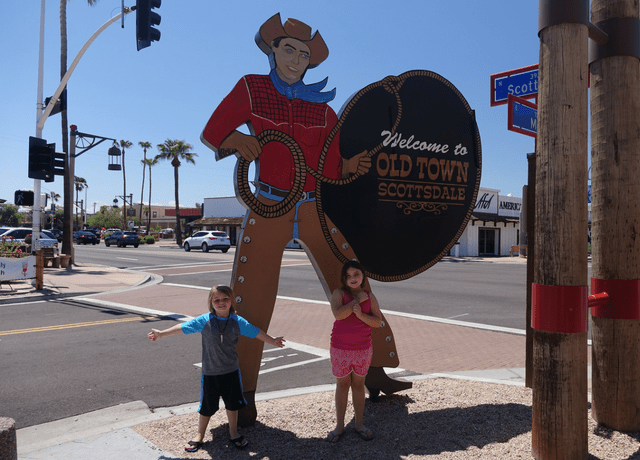 Surprisingly out of all the places we visited during our summer road trip, the kids couldn’t stop talking about how much they loved Scottsdale, Az. Maybe it was the hot desert nights swimming under the stars or the days taking it slow, wandering from store to store from bar to restaurant. Scottsdale is a desert beauty, beckoning visitors to come and relax. Needless to say, if Old Town Scottsdale wasn’t on your bucket list before, it should be now. 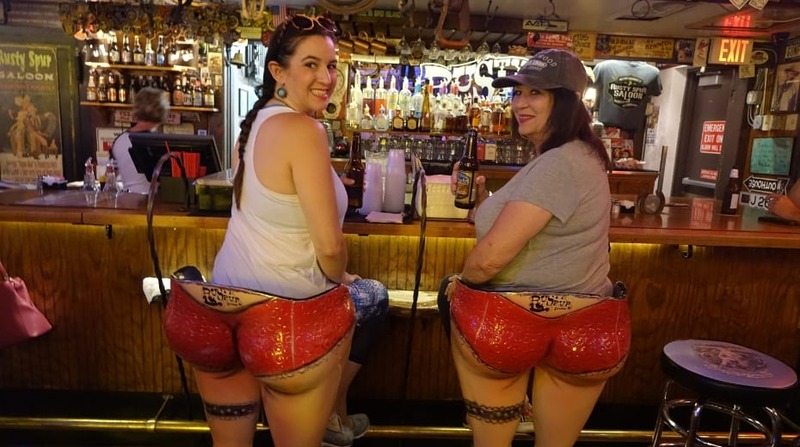 I love those bar stools! So last weekend all my girlfriends went to Arizona for a spa getaway, I couldnt go because it was my grandpa’s 106th birthday party (yeah, you dont skip that) so now I am even more determined for a fun, weekend in AZ! 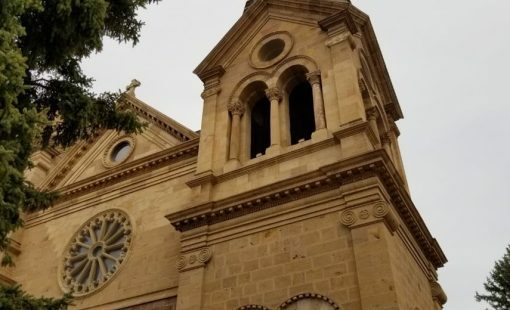 I had a blast when I visited the old town. 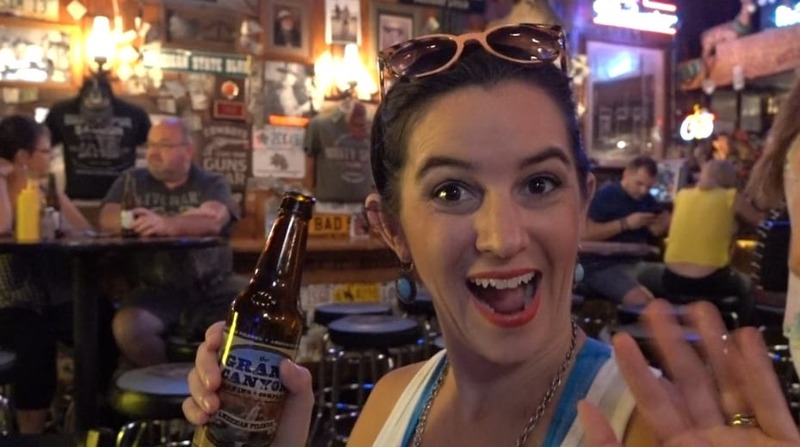 The Rusty Spur is definitely a quirky place. I wish I had stopped at the Australian bakery sounds like a good place. I’ll have to stop there next time. This is a fantastic article!! Thank you for providing such value to my guests, I’ll definitely be referring them to this link when they check in to my house down the street! All the best! Haha, chairs at the bar are so funny, loved it! And it looks like Scottsdale has so many things to offer to the visitors. Scottsdale seems to be a real gem! Pretty cool chairs, might have to grab one for myself! I keep hearing about how amazing Scottsdale is. I think I need to head down and check it out for myself! 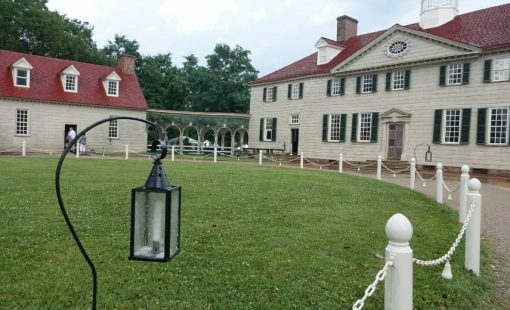 I love exploring the historic areas of cities and getting out into the nearby nature to hit the trails as well. So Scottsdale has a lot of what I’m after!